the Himalayan Kingdom of Tibet. 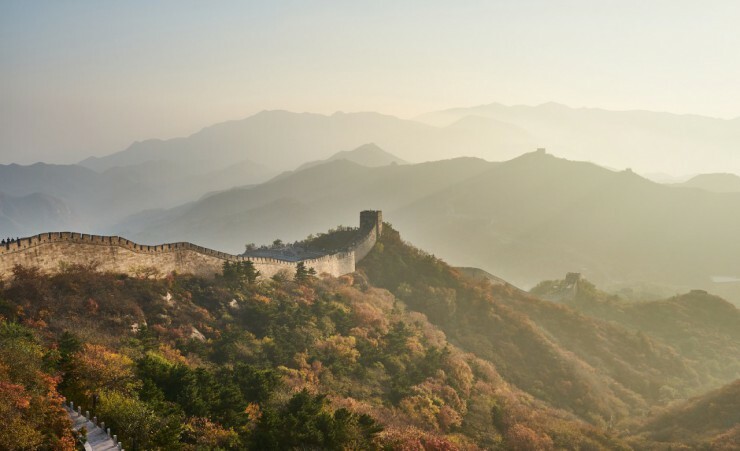 Stroll along the Great Wall of China and come face-to-face with Xi'an's Terracotta Warriors before travelling through incredible landscapes to Lhasa, the heart of Tibetan Buddhism and one of the highest cities in the world. 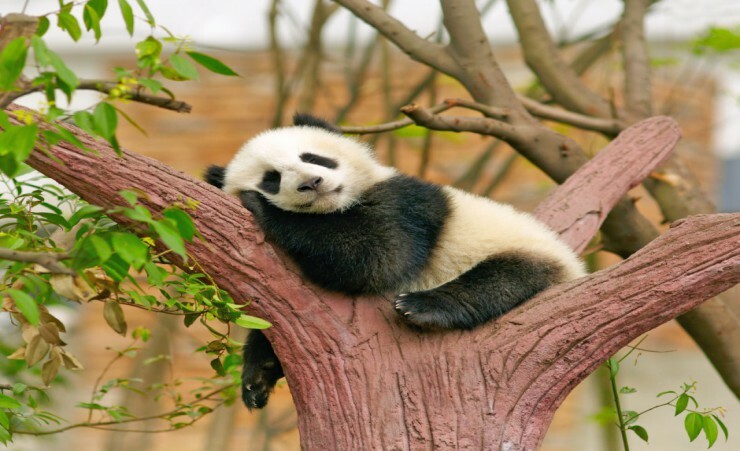 Finish your tour in Chengdu, meeting the charismatic Giant Pandas. 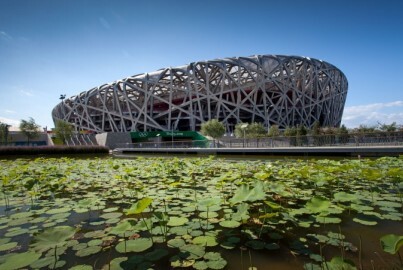 Depart London on your scheduled overnight flight to Beijing. On arrival in Beijing, meet your local guide before transferring to tonight's hotel. Travel to the Great Wall of China, built over 2,000 years ago as a final defence against marauding Mongol invaders. Stretching over 5,500 miles, stroll along the wall to admire panoramic views of mountain peaks and rolling grasslands. 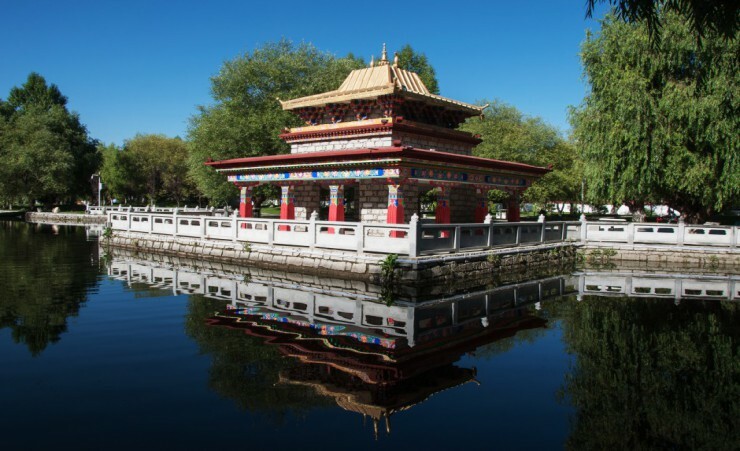 Return to Beijing and explore the traditional gardens and exquisite architecture of the Summer Palace. Visit expansive Tiananmen Square, the scene of many significant moments in Chinese history, before passing through the Gate of Supreme Harmony into the Forbidden City, the private kingdom of Emperors for over 500 years. 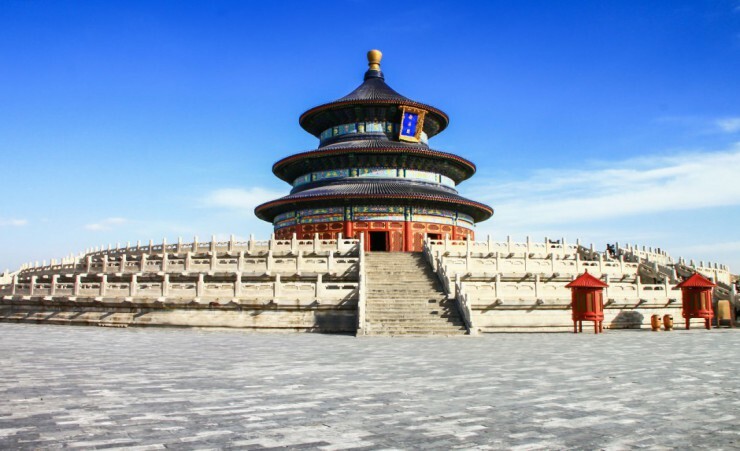 In the afternoon explore China's largest existing masterpiece - the 15th century Temple of Heaven before setting your senses racing with a delicious Peking duck dinner this evening. 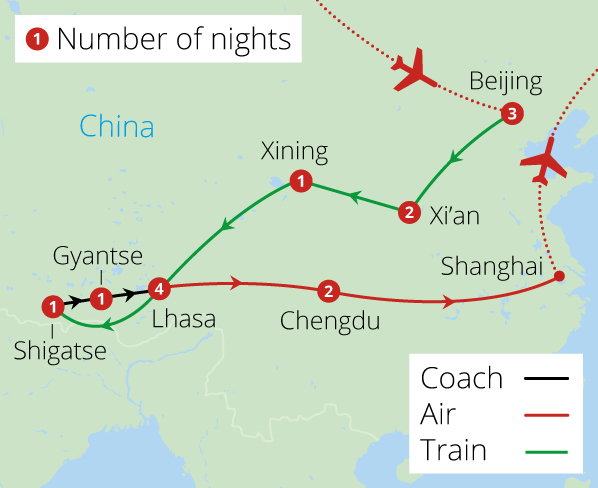 Tonight, board your overnight train to Xian. 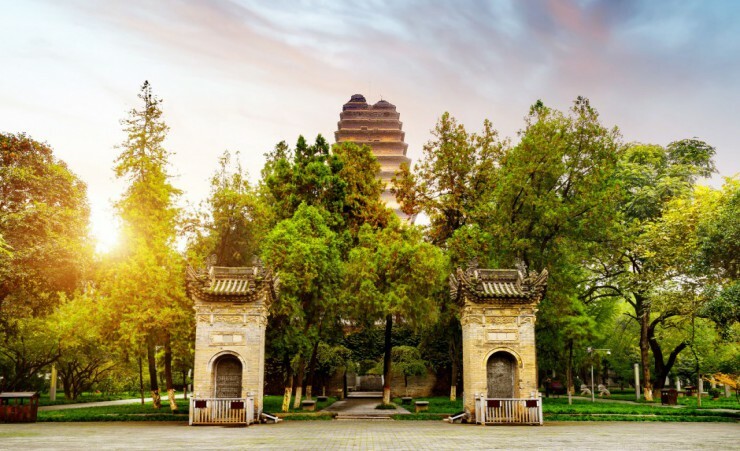 Starting point of the Silk Route and birthplace of ancient China, contemporary Xi'an is a fascinating city to explore. 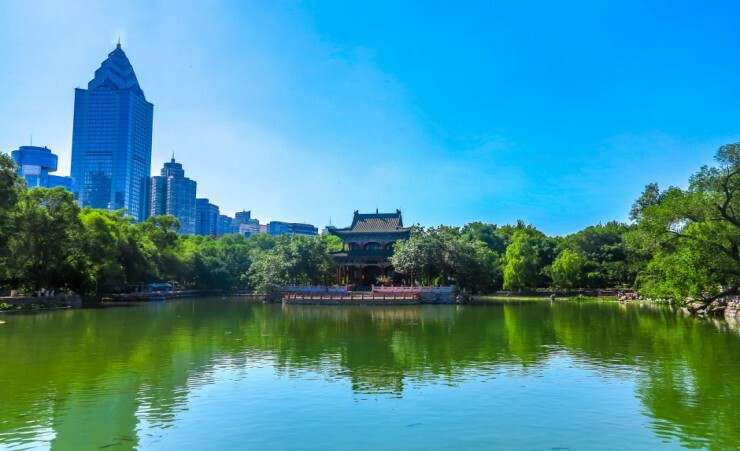 Wander along the 14th Century City Walls that still surround the heart of the town, before visiting the Small Wild Goose Pagoda built in 652 to hold sacred Buddhist figurines. 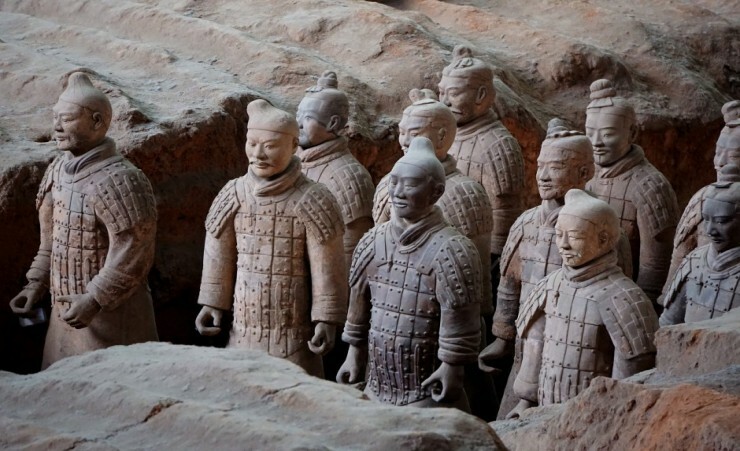 Begin today by witnessing the awe-inspiring 'Eighth Wonder of the World', Xi'an's hand-crafted 8,000 strong Terracotta Warriors, constructed to protect China's first emperor in the afterlife. 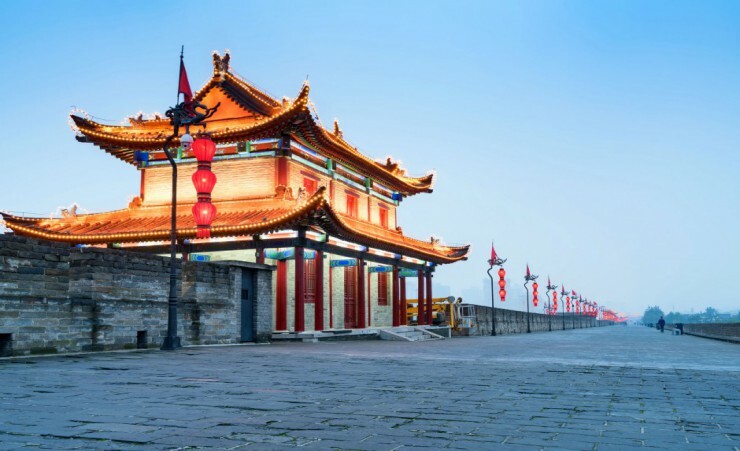 Continue onwards, crisscrossing through the narrow avenues of Xi'an's Muslim Quarter, teeming with bustling market stalls and fragrant cuisine and enjoy an evening of traditional music and dance at a dynamic Tang Dynasty show. Transfer to Xi'an's railway station for an early train to Xining, where you will visit the city's undulating hillsides and significant religious structures, including Kumbum Monastery - a perfect fusion of Han and Tibetan architecture, adorned with thousands of Buddhist paintings within its ornate prayer halls. In the evening board the overnight train for your epic journey on the highest railway on earth. 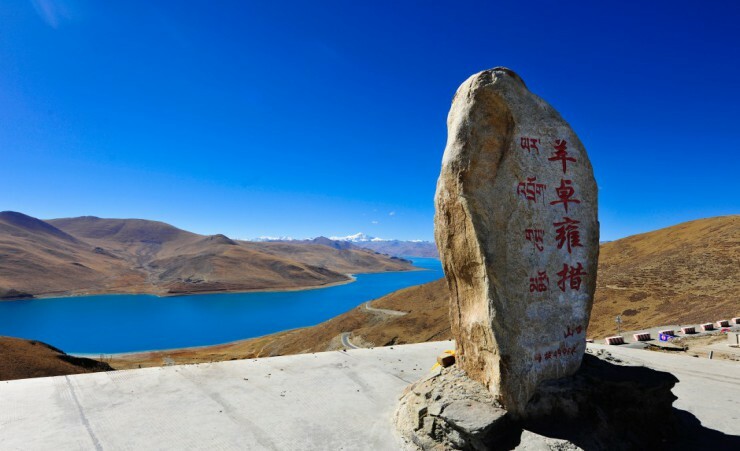 The Qinghai-Tibet Railway is one of the 21st Century's greatest engineering marvels, taking you past glaciers, mountains and Himalayan villages on your climb to Tibet. Cross the highest point at Tangula Pass early in the morning where long-haired yaks dot a countryside of surpassing beauty. On arrival into Lhasa, transfer to the hotel for an evening at leisure. After breakfast, marvel at Tibet's most iconic landmark, the Potala Palace. Guarded by gargantuan walls and turrets, this exceptional winter palace of the Dalai Lama majestically sits 100 metres above the city and continues to serve as a spiritual symbol of Tibetan Buddhism. After a short walk, gaze in awe at the golden blaze radiating from the 7th-century spiritual hub of Jokhang Temple, which, unsurprisingly continues to attract thousands of pilgrims. Following in their footsteps, snake the pathways of Borkhar Bazarre, a buzzing market square which encompasses this 'House of Buddha', taking the opportunity to pick up a souvenir along the way. After breakfast, visit Norbulingka, a spellbinding palace complex and regal summer residence of the Dalai Lama. 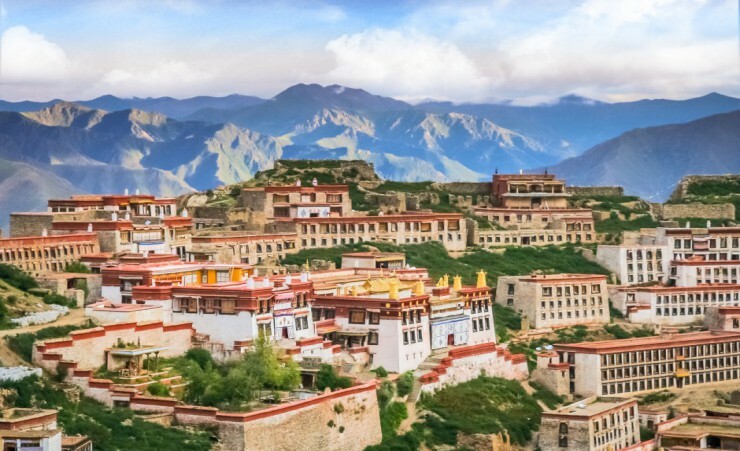 Translating as 'Jewel Garden', stroll around the luscious gardens, bursting with flourishing landscapes, before taking in the delights of the lavish 600-year-old Sera Monastery. Nestled in the shadows of Tatiput Hill, wonder at this incredible monument's golden scriptures and elaborate murals which envelop the walls of one of the greatest monasteries in Tibet. Depart Lhasa this morning and bask in the early morning sunshine from your train to Shigatse. On arrival, enjoy a guided tour of the magnificent Tashilunpo Monastery, Tibet's largest religious establishment, and view the abundant temples and mesmerising golden tombs of former Panchan Lamas within this breathtaking spiritual complex.Continue to Gang Gyen carpet workshop to observe the skilled workmanship of local women, meticulously weaving and spinning traditional Tibetan carpets, characterised by their bright colours and intricate design. 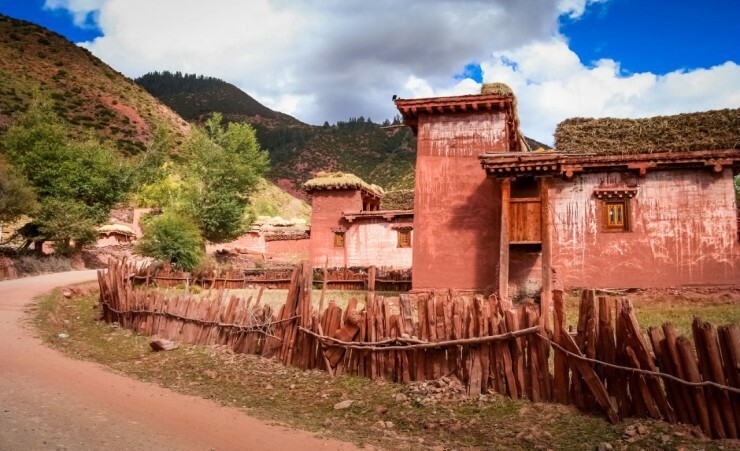 Experience an authentic taste of Tibetan life with a visit to an orthodox family home, gaining a fascinating insight into the ways in which religion has moulded their culture. This afternoon, discover the charm of Pelkor Chode Monastery, distinctive for its unique exterior and entrancing vistas of surrounding mountainsides and admire a multitude of Tibetan sutras, which continue to entice a constant influx of intrigued pilgrims. 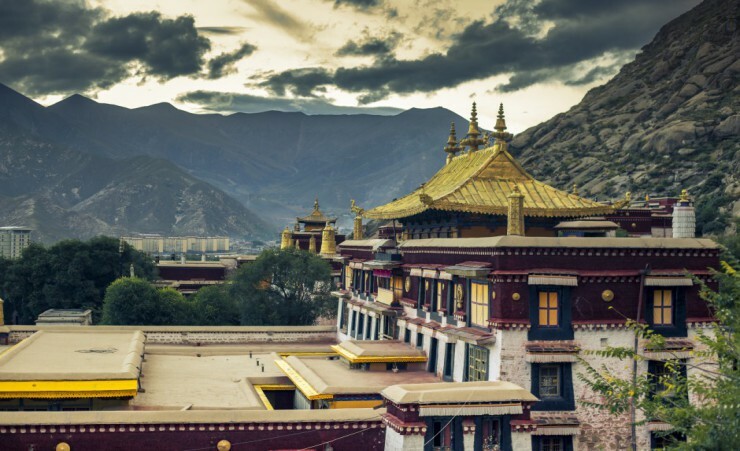 Enjoy a day of serenity with a visit to some of Tibet's most astounding scenery. Surrounded by towering snow-sprinkled mountaintops, pause at the peaceful freshwater lake of Yamdrok, an astonishing turquoise vision which glistens upon the sun's arrival. Next, prepare to be overwhelmed by the imposing Karola Glacier from the neighbouring highway only 300 metres away and look towards the wispy clouds and untouched white snow-capped peak, before returning to Lhasa this evening. 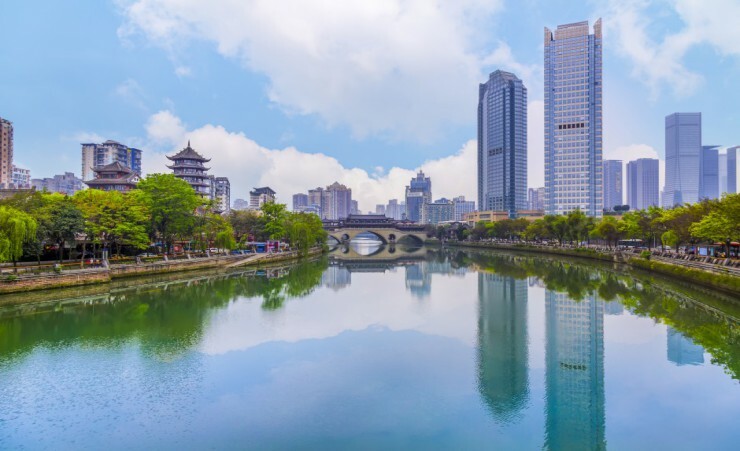 Following your morning flight to the diverse city of Chengdu, incorporate a visit to Chengdu People's Park; saunter this area of contrasts, basking in its tranquil charm with a refreshing cup of tea from a traditional teahouse, or alternatively, participate in a vivacious performance in Rockery Square. 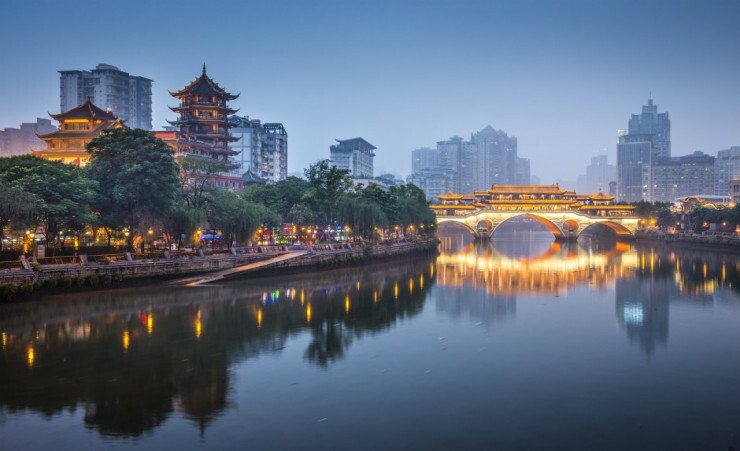 A pleasant meander leads to the quaint streets of Wide and Narrow Alleys, offering a laid-back atmosphere and glimpse of ancient Chengdu from its plentiful cafes and courtyards to Xian. Take delight in a once-in-a-lifetime trip to Chengdu Panda Breeding and Research Centre, home to one of China's largest panda habitats. From a close-up view, look out for pandas snacking on a tasty treat, or peeping out of treetops in enclosures built to imitate their natural habitat. Conclude your adventure tonight with a succulent Sichuan meal. Optional excursion (payable locally) - Immerse yourself in a night of vibrant dance and history at a Sichuan Culture Evening Show. After breakfast, transfer to the airport for your return flight to the Uk via Beijing. Breakfast is always western style and served in the hotel each morning. Lunch and dinner will be taken in local Tibetan and Chinese restaurants and served with either one beer or soft drink. You will require a visa for entry into China. We work closely with The Travel Visa Company who will be able to arrange your visa for you on your behalf. Please call them on 01270 250 590 and quote ?Mercury Holidays?. The cost of the visa is approximately £199.00, when calling the Travel Visa Company they will advise you of the most up to date fees. The visas take around 10 working days to issue and are valid for unlimited trips to China for 2 years from the date of issue. We therefore recommend that you apply for your visa 3 months before travel, however, please be aware that your passport will be required for the application so make sure that you will not need it during this time. You will require a visa for entry into Tibet. If you have a British passport we have included the cost of the visa in your tour and this will be arranged for you by our team in China. Important: in order for us to process your visa for Tibet you must provide us with a colour photocopy of your passport. Therefore, you do not need to organise a visa for Tibet before you travel. Please note: we can only arrange a visa for British passport holders, all other nationalities are on request and you must check with us prior to booking. We strongly recommend that you and all members of your party are suitably insured as soon as you book your holiday. It is a condition of booking that you must have suitable travel insurance. It is important that you purchase travel insurance that suitably covers your participation in whatever activities you may undertake at the time that you make your booking. To assist you with this, we have arranged travel insurance in partnership with Holiday Extras. To arrange your travel insurance with Holiday Extras, please call 0800 781 4237 and quote 'WK830' for preferential rates. Please ensure you provide us with the name of your insurer, policy number and their 24-hour emergency contact number. Mercury Holidays will not be liable for any costs incurred by you due to your failure to take out suitable travel insurance from the date of booking. Your initial flight is to Beijing International Airport with Air China (CA) departing from London Heathrow Terminal 2. Your return flight is from Chengdu Shuangliu International Airport, via Beijing to London Heathrow. IMPORTANT: Please note that final flight details will be confirmed on your e-ticket and final documentation including hotel information will be sent to you approximately 10 days before departure. It is your responsibility to check any health/vaccination requirements for your booked arrangements. We can only provide general information about this. Health and hygiene facilities and disease risks vary from country to country. You should take health advice about your own needs as early as possible and in good time before your departure. Altitude sickness is a fairly common condition that can occur when you ascend to a high altitude (generally higher than 2,500 metres above sea level) quickly. Therefore, you may find you experience some symptoms at this altitude. It is advised that at these high altitudes, you keep hydrated. If you do experience symptoms of altitude sickness during your tour, ensure you tell your guide immediately who will be able to advise the best thing for you to do. Sources of information include; www.fco.gov.uk, www.travelhealthpro.org.uk, www.hpa.org.uk, or your General Practitioner. This tour is accessible to most people with a good level of fitness and normal mobility. It involves climbing of steep stairs and getting on and off coaches & trains. This tour is not suitable for anyone with walking difficulties. The minimum number of travellers in your group will be 10, and the maximum will be 40. If in the unlikely event there are less than 10 people booked on your tour date, we will try to operate your tour with lower passenger numbers. If we are not able to operate your departure date, then you may be asked to change to a different date or a full refund will be made available to you should this alternative not be suitable. The currency in China and Tibet is the Renminbi, known as RMB or CNY. It is often referred to as the yuan. We recommend that you exchange your currency before you leave the UK. US Dollars are widely accepted in China and Tibet should you wish to keep an alternative currency on you. You will need to take money with you to cover any personal purchases such as souvenirs, laundry, any meals not included in the itinerary as well as drinks and any additional snacks; Approximately £300 per person will be sufficient for the duration of the tour. It is a good idea to try and maintain a supply of small notes and change in the local currency for tipping or small purchases. It is customary to tip your local guide and driver approximately £4.00 (CNY35.00) per person per day. For your convenience your local guide will collect tips at the end of each city visited, approximately £45.00 (CNY400.00) per person for the total duration. Tips are collected in Chinese Yuan. The order of events and sightseeing may vary according to local conditions or for operational purposes. The schedules of the domestic airlines in country are subject to frequent changes. For this reason, we have indicated approximate times only. Your local guide will inform you of any schedule changes as they are informed of them. 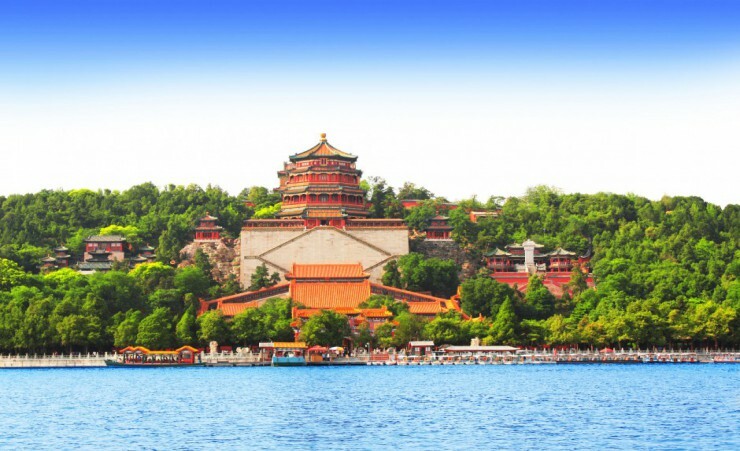 One of China's six ancient capitals, Beijing truly is an extraordinary place to visit. 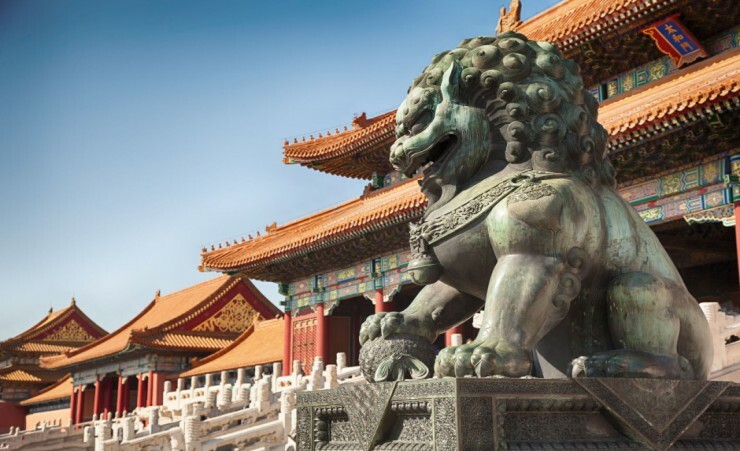 With a rich history spanning over 5,000 years and famous sites including the Great Wall, Tiananmen Square and the Summer Palace, this city promises to intrigue and delight.